M.J. Armstrong - Brampton, Alconbury, Upton, Sawtry, Stilton. 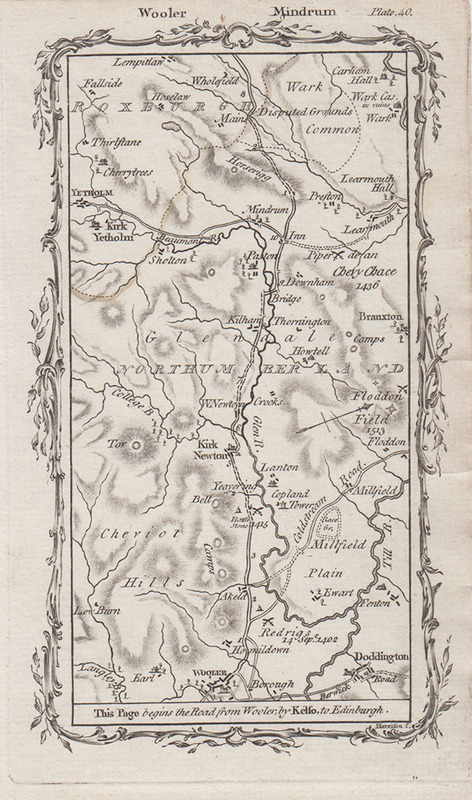 A scarce antique road map from "An Actual Survey of the Great Post-Roads between London and Edinburgh" by Mostyn John Armstrong, published in 1776. 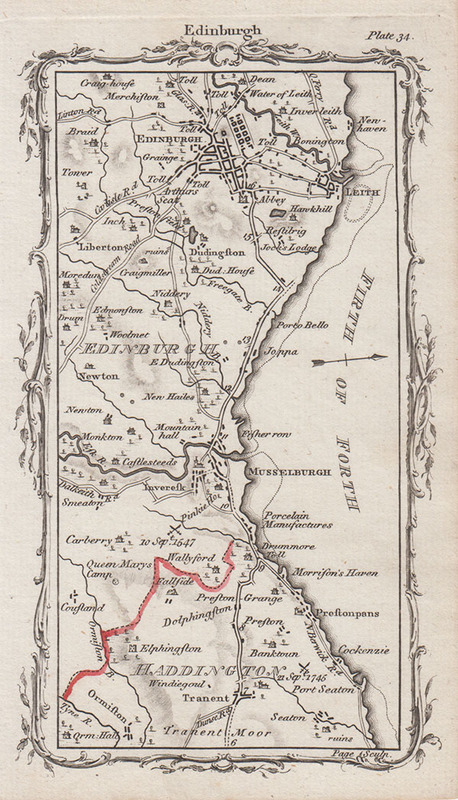 Each map shows a section of the road from London to Edinburgh drawn on the scale of half an inch to the mile. These maps are not strip road maps, but take the form of a conventional map covering an area of approximately 12 miles from south to north and 7 miles east to west. This is Plate 6 - Brampton, Alconbury, Upton, Sawtry, Stilton. M.J. Armstrong - Wetherby, Boroughbridge, Kirby Hill. 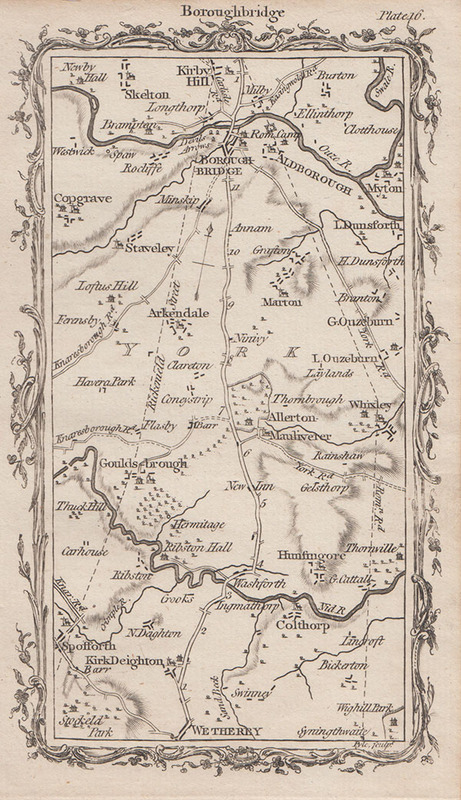 This is Plate 23 - Wetherby, Boroughbridge, Kirby Hill. M.J. Armstrong - Croft (near Darlington, Darlington, Aycliffe. 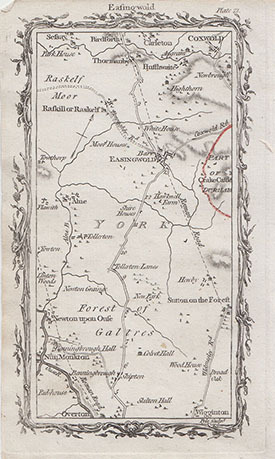 This is Plate 23 - Croft (near Darlington, Darlington, Aycliffe. M.J. Armstrong - Wooler, Akeld, Kirknewton, Mindrum. 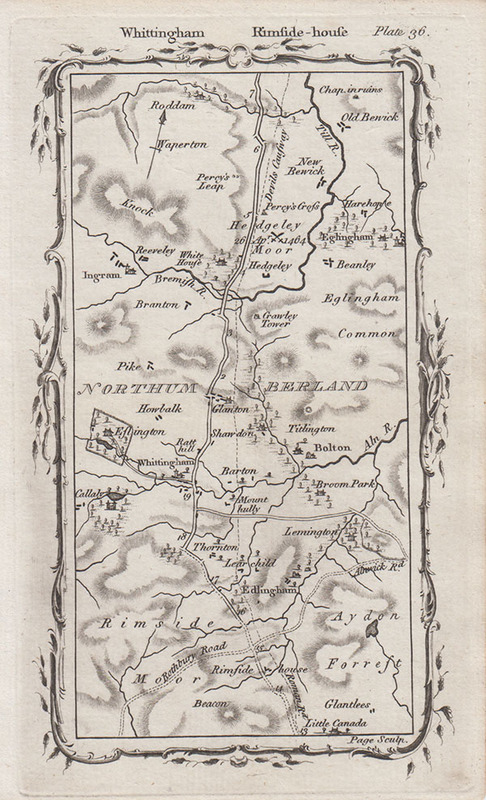 A scarce antique road map from "An Actual Survey of the Great Post-Roads between London and Edinburgh" by Mostyn John Armstrong, published in 1776. Each map shows a section of the road from London to Edinburgh drawn on the scale of half an inch to the mile. These maps are not strip road maps, but take the form of a conventional map covering an area of approximately 12 miles from south to north and 7 miles east to west.. 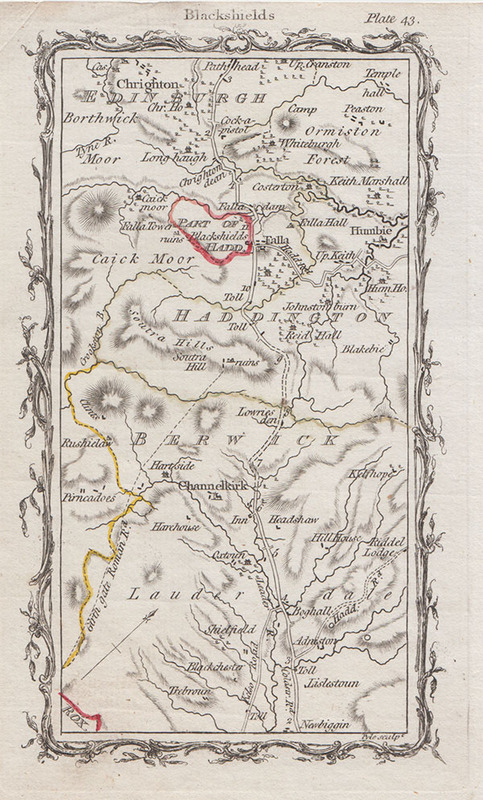 This is Plate 40 - Wooler, Akeld, Kirknewton, Mindrum. M.J. Armstrong - Redpath Moor, Birkhill, Lauder. 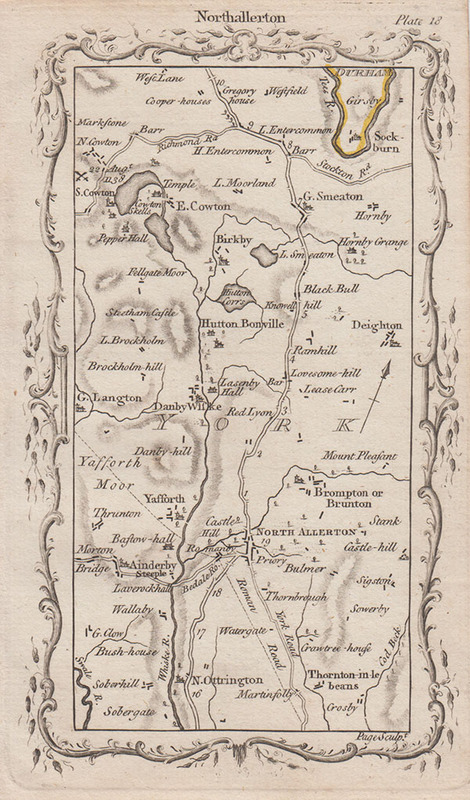 This is Plate 42 - Redpath Moor, Birkhill, Lauder. M.J. Armstrong - Newbiggin, Channelkirk, Falla, Crighton. This is Plate 43 - Newbiggin, Channelkirk, Falla, Crighton. M.J. Armstrong - Tadcaster, Copmanthorpe, York. 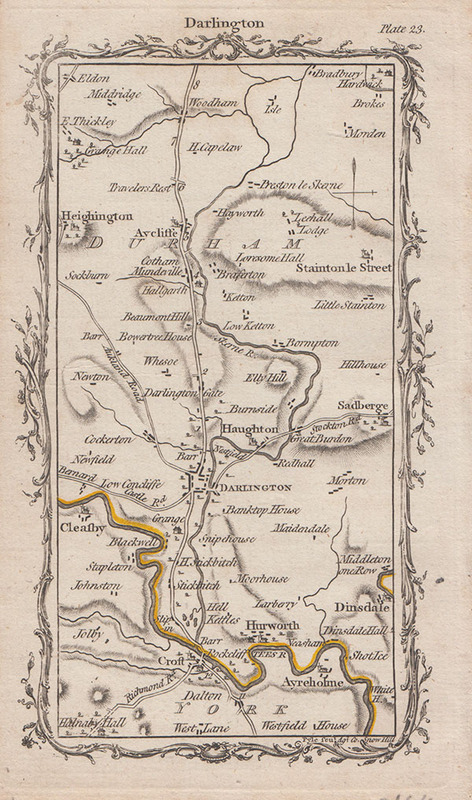 This is Plate 20 - Tadcaster, Copmanthorpe, York. M. J. Armstrong - Long Bennington, Balderton, Newark, North Muskham. 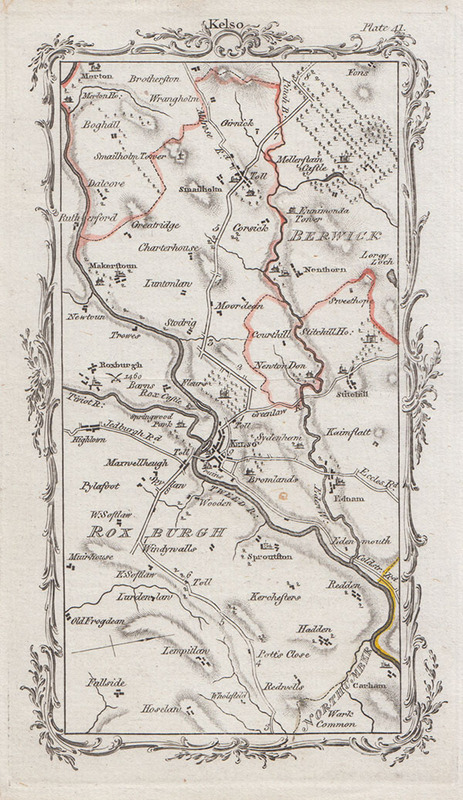 This is Plate 10 - Long Bennington, Balderton, Newark, North Muskham. 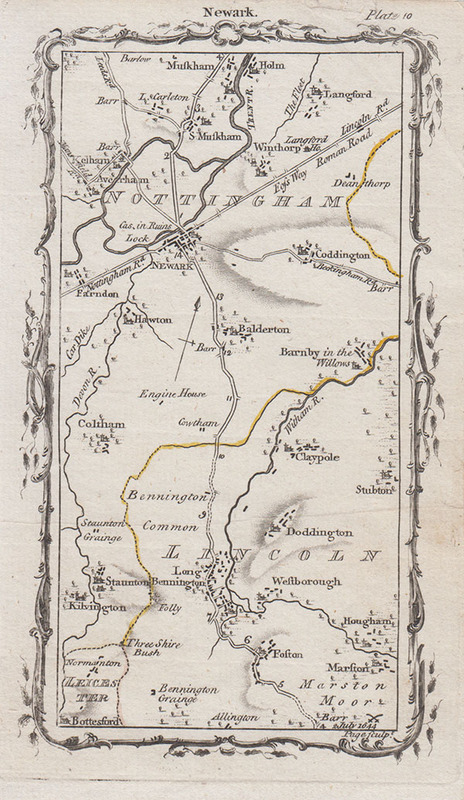 This is Plate 21 - Shipton (near York), Easingwold, Thomanby, Birdforth. M. J. Armstrong - Kirby Hill, Dishforth, Topcliffe, Sandhutton, South Otterington. 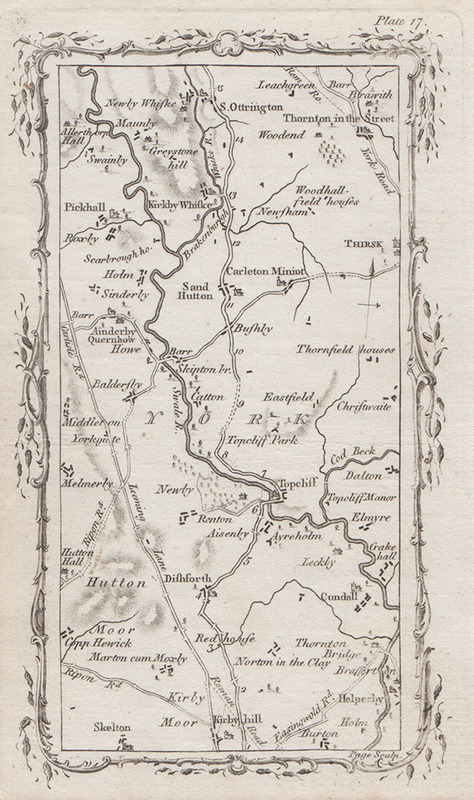 This is Plate 17 - Kirby Hill, Dishforth, Topcliffe, Sandhutton, South Otterington. M. J. Armstrong - Thirkelby, Thirsk, Thornton-le-Street, Northallerton. This is Plate 22 - Thirkelby, Thirsk, Thornton-le-Street, Northallerton. M. J. Armstrong - Cromwell, Carlton on Trent, Weston, Tuxford, West Markham, West Drayton, Gamston. 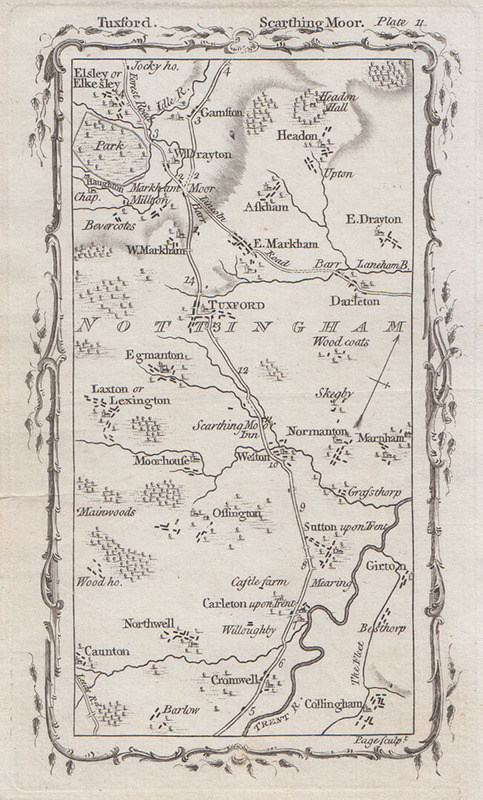 This is Plate 11 - Cromwell, Carlton on Trent, Weston, Tuxford, West Markham, West Drayton, Gamston. M. J. Armstrong - Girtford, Tempsford, St. Neots, Little Paxton, Buckden. 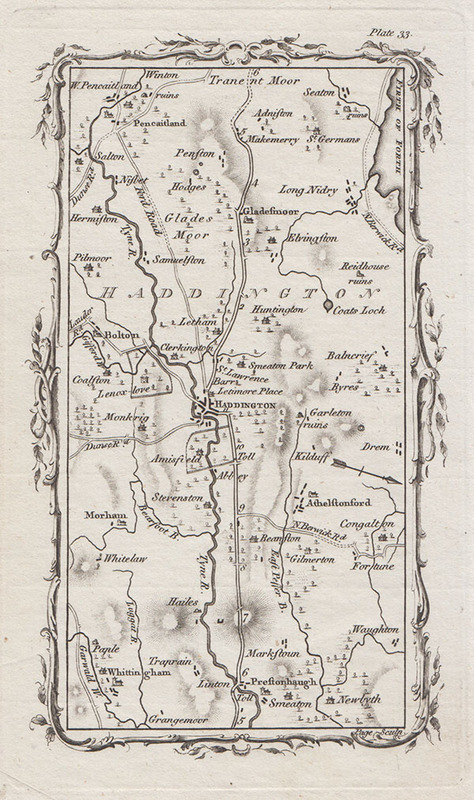 This is Plate 5 - Girtford, Tempsford, St. Neots, Little Paxton, Buckden. M.J. Armstrong - Huntingdon, Great Stewkley, Little Stewkley, Upton, Sawtry and Stilton . 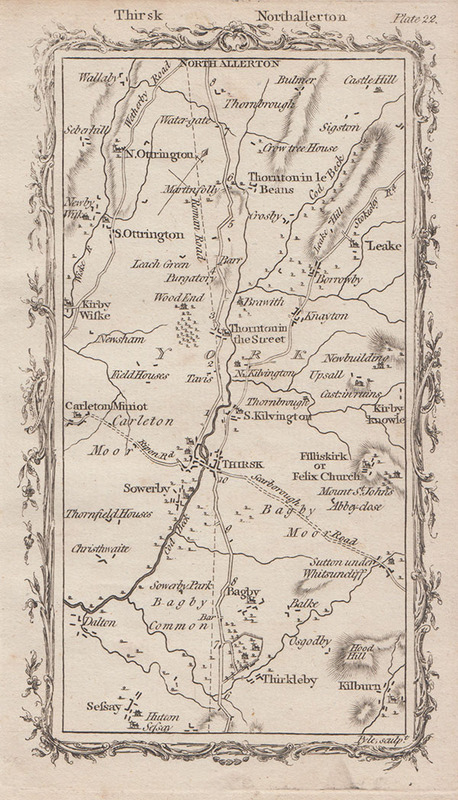 A scarce antique road map from "An Actual Survey of the Great Post-Roads between London and Edinburgh" by Mostyn John Armstrong, published in 1776. Each map shows a section of the road from London to Edinburgh drawn on the scale of half an inch to the mile. These maps are not strip road maps, but take the form of a conventional map covering an area of approximately 12 miles from south to north and 7 miles east to west. 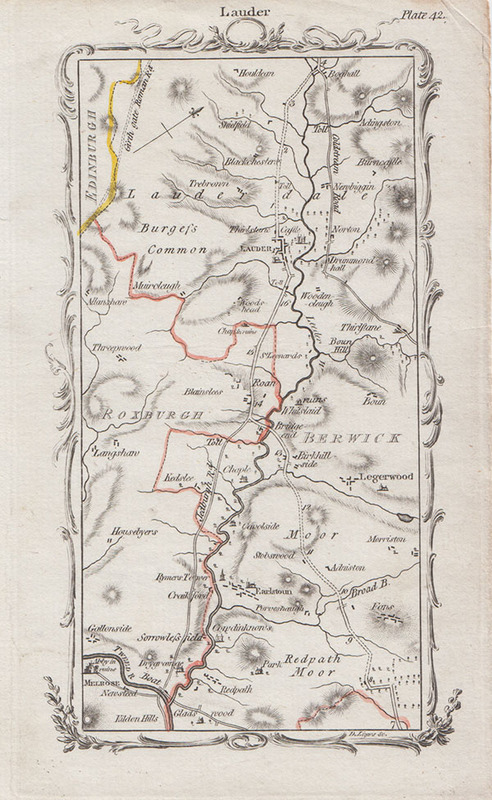 "An Actual Survey of the Great Post-Roads between London and Edinburgh" by Mostyn John Armstrong, published in 1776. 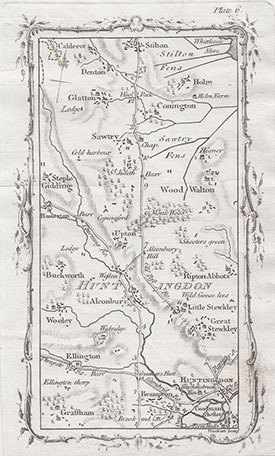 This is Plate 6 - Huntingdon, Great Stewkley, Little Stewkley, Upton, Sawtry and Stilton . M. J. Armstrong - Cornhill, Coldstream, Greenlaw. This is Plate 38 - Cornhill, Coldstream, Greenlaw. M. J. Armstrong - Edlingham, Glanton, Hedgeley. 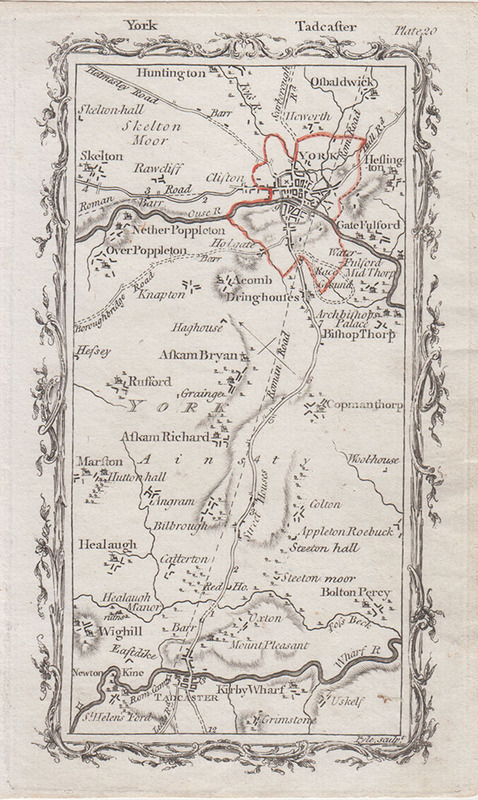 This is Plate 36 - Edlingham, Glanton, Hedgeley. M. J. Armstrong - Beal, Cheshwick, Berwick. 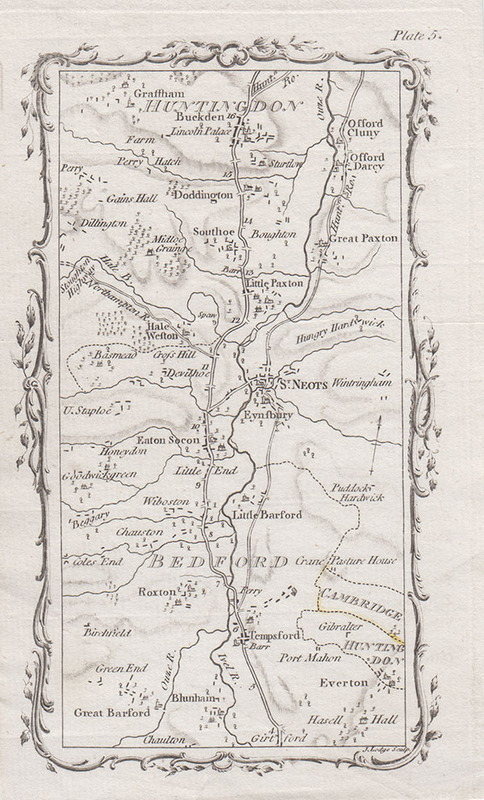 This is Plate 30 - Beal, Cheshwick, Berwick. 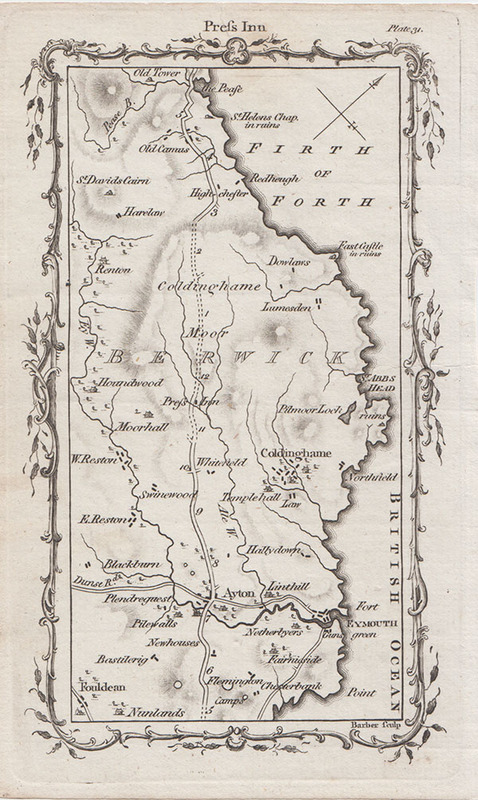 M. J. Armstrong - Cockburnspath, Broxburn, Dunbar, Bellhaven, Tyningham. 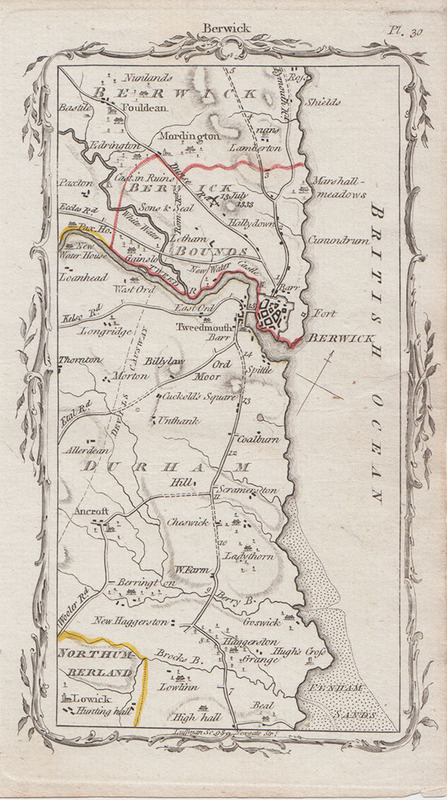 This is Plate 32 - Cockburnspath, Broxburn, Dunbar, Bellhaven, Tyningham. M. J. Armstrong - Prestonhaugh, Haddington, Tranent Moor. 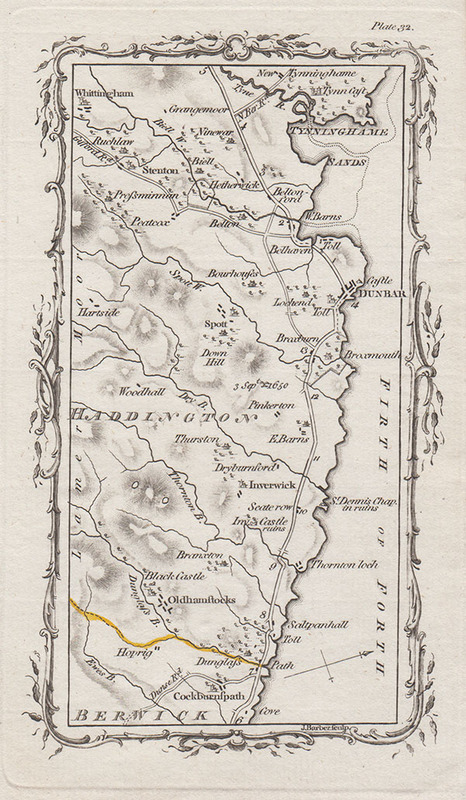 This is Plate 33 - Prestonhaugh, Haddington, Tranent Moor. M. J. Armstrong - Tranent, Musselburgh, Edinburgh. This is Plate 34 - Tranent, Musselburgh, Edinburgh. M. J. Armstron - Windywalls, Kelso, Mellerstain Castle.. This is Plate 41 - Windywalls, Kelso, Mellerstain Castle. M. J. Armstrong - Redpath Moor, Birkhill, Lauder. M. J. Armstrong - Ayton, Press Inn, approach to Cockburnspath. This is Plate 31 - Ayton, Press Inn, approach to Cockburnspath.